Norway comes first in this year’s Prosperity Index, followed by New Zealand in second place, reversing last year’s pattern. They each represent two distinct groups of countries and two distinct models for delivering prosperity: Nordic and Anglosphere. Both groups of countries have the highest prosperity scores in the world, and each group demonstrates that more than one path to prosperity is possible. Since the middle of the last century, the Nordic countries (Norway, Sweden, Finland, Denmark and Iceland) have been regarded as model social democracies (with relatively homogenous populations). Their citizens enjoy some of the highest living standards the world can offer, with an economic model that offers minimal barriers to free trade, fosters private ownership and promotes socially egalitarian outcomes, in conjunction with a generous welfare state. A recent United Nations World Happiness Report ranked Nordic countries at or near the top in a number of its indicators, including healthy life expectancy, perceived freedom to make life choices, and freedom from corruption. Results from the Prosperity Index this year confirm this assessment. Treating each bloc, in turn, as an aggregate, the Nordics would rank second in the world for overall prosperity behind New Zealand, while the Anglosphere bloc (Australia, Canada, Ireland, New Zealand, United Kingdom) would sit at seventh, between Denmark and Germany. 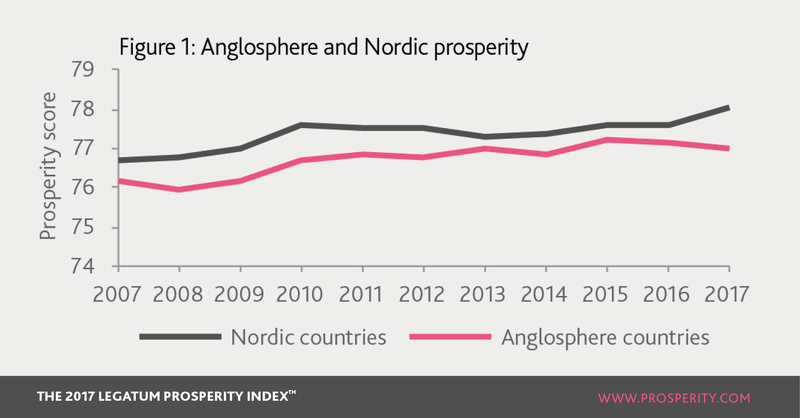 The Nordics collectively enjoyed better prosperity when compared to their Anglosphere counterparts for the entire life of the Prosperity Index; and the gap between the two is now the biggest it has ever been, after Anglosphere prosperity fell in 2017 (Figure 1). Among the five Nordic nations, only Denmark failed to improve its prosperity this year; and even there, the decline in overall score was small. By contrast, all the Anglosphere nations, except Ireland, saw their scores fall. In prosperity terms, the Nordics have stronger Governance, Economic Quality and Safety and Security, as well as better Health and Natural Environment – and even more significantly, they have improved on their already strong position in all five areas in 2017. The Nordics lead the Anglosphere in all but seven of 33 sub-pillars of the Index (Figure 2). The Anglosphere nations lead in a number of key areas. They have a better Business Environment thanks to much greater access to credit, fewer hurdles in getting businesses started and a more flexible labour market. Per capita GDP growth in the Anglosphere has been faster in the last five years than in the Nordics, while a greater proportion of the Anglosphere’s adult population is engaged in the labour force. There are also some clear Anglosphere strengths in Social Capital – a greater proportion of the population is engaging with society through informal donations and volunteering their time, and people are more likely to come to the aid of strangers. 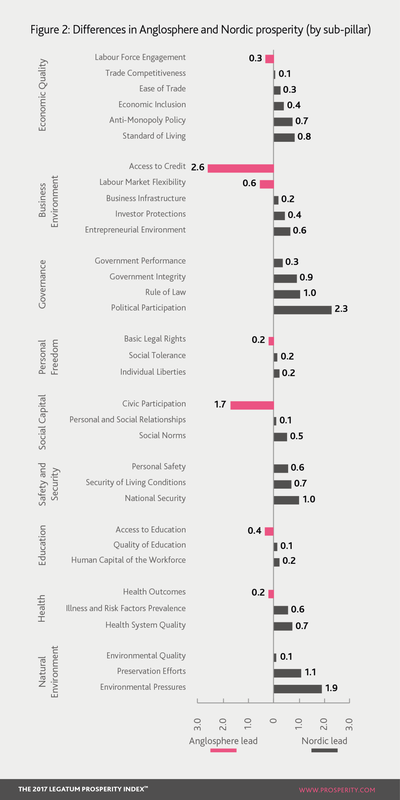 Personal Freedom and Education are broadly comparable across the two blocs. The picture therefore is of two distinct routes to prosperity. The Anglosphere nations have presented themselves as more diverse centres of enterprise with thriving social capital, whilst the Nordic model has for a long time offered a high standard of living and egalitarian outcomes to its citizens. Yet there have been signs more recently of the two becoming increasingly similar. For example, the quality of Governance is strengthening in many Anglosphere countries; and the Nordics are increasingly opening themselves to enterprise. Stockholm now produces the second-highest number of billion-dollar tech companies per capita in the world, after Silicon Valley, and Swedes are the most optimistic in the developed world in terms of perceiving opportunity for business. The Nordics score more favourably than the Anglosphere nations in anti-monopoly policy, and this improved in 2017. In other words, where heavily regulated economies existed in the past in which competition was less prevalent, Nordic markets are becoming far more open and dynamic – a precondition for a thriving economy. The picture therefore is of two distinct routes to prosperity. The Anglosphere nations have presented themselves as more diverse centres of enterprise with thriving social capital, whilst the Nordic model has for a long time offered a high standard of living and egalitarian outcomes to its citizens. It is not just the policy environment that has supported the Nordics’ high levels of prosperity, but also culture. Indeed high levels of trust and mutual cooperation established over centuries is a major part of what has allowed the Nordic governance model of the last 50 years to come into existence. We can also see the effects of this culture of trust in the success of the Nordic diaspora abroad. The 12 million citizens in the US claiming Nordic origin, many of whom moved several generations ago in the 19th century, earn on average $10,000 more than the US average, and they experience half the national poverty rate. Even with the passing of 150 years, the Nordic brand of culture and values continues to generate significant prosperity away from home. The two blocs have also differed historically in levels of immigration. 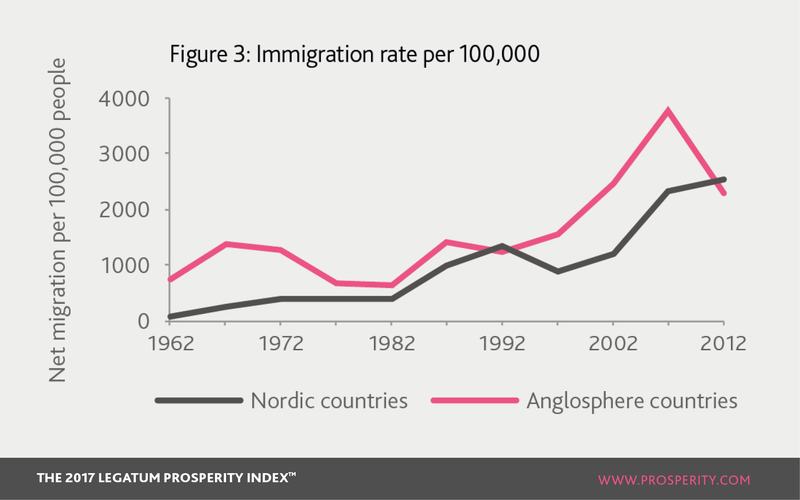 Statistics on migration for the last 50 years indicate that people have far more readily been migrating into the Anglosphere than into the Nordic nations; even in per-capita terms, movement has been greater at almost every point in the last 50 years (Figure 3). The challenges of immigration are not new to the Anglosphere – rather its nations have, over time, developed a route to prosperity that accommodates input from a diverse range of cultural backgrounds. Enterprise is strong, there is a sense of openness in relationships and the skills coming from abroad have enabled economies to grow and thrive. But the balance between the two blocs is now changing. More recent developments in Europe, such as the eastern expansion of the EU and then the refugee crisis, have meant that the difference between the Nordics and the Anglosphere in migration terms is not as pronounced as it has been in the past. In 2015, Sweden took in more asylum seekers per capita than any other European Union member state, with Norway and Finland fourth and fifth, respectively. The challenges of immigration are not new to the Anglosphere – rather its nations have, over time, developed a route to prosperity that accommodates input from a diverse range of cultural backgrounds. There may thus be signs that the Nordics are encountering some of the same challenges to prosperity that the Anglosphere has long faced. Nordic citizens’ confidence in the government has decreased in the last ten years, along with perceptions of the quality of public services – two areas in which the Nordics have led the Anglosphere nations. So too in safety terms – homicide rates have increased in Sweden in the last five years and the nation’s citizens report that they feel less safe at night. As movement of people into the Nordics increases, the desire by their populaces to maintain universal high levels of welfare is being increasingly challenged. With the changing dynamics of its population comes a new landscape in which to foster prosperity, and with it an ever-greater likelihood that the Nordic nations will find themselves on some of the same paths as their Anglosphere counterparts.